CAMDEN YARDS. SOUVENIR BASEBALL. If you are purchasing more than one. 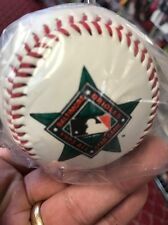 Up for auction is a Cal Ripken Commemorative Baseball.Still brand new.Package has some wear.Comes as is.If you have any questions please ask. (Budig issued only one ball during his tenure. What a classic to marry a players greatest triumphs with the ball of that year. Mac issued 10 balls during his era: 1) 1974-75, and a different ball for 1976 thru 1984. 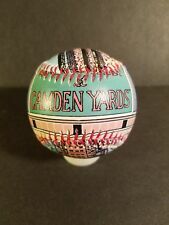 THERE ARE BEAUTIFUL COLORED GRAPHICS ON THIS BASEBALL AS SHOWN IN THE PHOTOS. OF THE SALE. 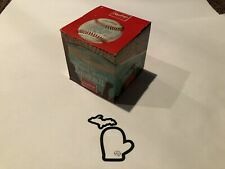 Nations Bank Baltimore Orioles Souvenir Printed Autographed Style Baseball in Display Case. The globe and base are both plastic. The globe has a couple of marks that may be able to be buffed out, the ball is in excellent clean condition. Ball display stand is included. 1995 Cal Ripken Jr. 3 photo ball set - by the numbers. Brand New Factory Sealed. We normally answer you within 24 hours. We can not be responsible if we did not know, and you did not ask. Problems are easily fixed. What You See in Pictures Is what you will receive. I do my best to describe each item. So, EVERYTHING is sold AS IS. 32 signatures in total! Autographes were obtained during spring training so there are no "clubhouse" signatures on this ball. The only two starters not present are Luis Aparicio (yeah I wish he was on it too) and Curt Blefary. 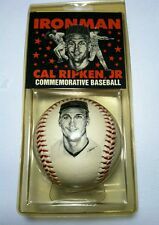 Up for bid is a commemorative baseball of Cal Ripkens consecutive games streak. Please let me know if you have any questions and be sure to check out my other auctions as I will gladly combine shipping on multiple items won. Everything I sell will be shipped safely and securely within one business day after payment. Please let me know how I can help you every step of the way. Please note the condition of the item in the provided photos. I will do everything to ensure you get 5 Star treatment! These have vivid color and were were found at a dealers box from a card show. These are new, although not direct from the factory. A must for your collection, or for the autograph collector. You will be receiving the exact item you see in the pictures. Cal Ripken Jr. Plate No. 11474 E. -I will take multiple pictures front, back, & corners for you to see the condition of the item(s). Note: I'm not a professional grader, this is only an opinion. The president on the baseballs is Gene A. Budig. Ending Apr 28 at 10:35AM PDT9d 2hTeam: Baltimore OriolesPlayer: Cal Ripken, Jr.
Cal Ripken Jr. Has two pin holes on each side of cal's bat. (see pictures). 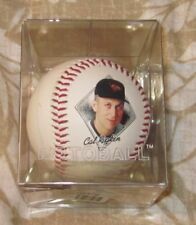 Cal Ripken Jr. & Lou Gehrig Commemorative Baseball "Ironmen of Baseball"
The item for sale is a commemorative baseball with Cal Ripken Jr & Lou Gehrig on it commemorating when he tied the MLB record for consecutive games played. It comes in the original protective hard case and plastic stand. It was on display but it is in great condition. It would be a great buy for any collector. It is being sold as is per the pictures.